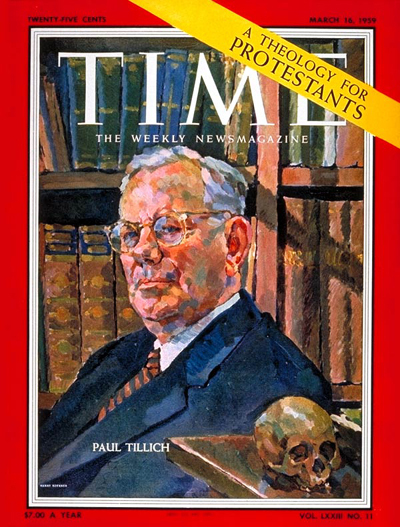 While Tillich writes with ‘admirable intelligence … the net effect [of his thought] is one of ambiguity, even futility – as if the theologian were trying to revivify the Christian corpse with transfusions of Greek humanism, German metaphysics, and psychoanalytical theory. Terms like “grace” and “Will of God” walk through these pages [i.e., the pages of Morality & Beyond] as bloodless ghosts, transparent against the milky background of “beyond” and “being” that Tillich, God forbid, would confuse with the Christian faith’. – John Updike, Assorted Prose (London: Andre Deutsch, 1965), 183. To be sure, I’ve always found Tillich’s sermons to be quite engaging; but Updike’s description of Tillich’s Morality & Beyond rings true for most of Tillich’s three-volume systematics as well. I would certainly agree there! Btw, Jason have you ever read any of Austin Farrer’s works? Now there was an Anglican thinker! Not a surprising perspective from Updike, as his theological sensibilities were clearly influenced by Barth and Kierkegaard. @ Robert: It has been a while, but some years ago I read A Celebration of Faith and Faith and Speculation. What would you recommend? @ Paul: I didn’t post it because it was a ‘surprising perspective’ but because Updike has a way of putting things that leaves his readers with that ‘that’s exactly right’ feeling. One stellar example of this would be his essay ‘The Unread Book Route’ which was published in 4 March, 1961, edition of The New Yorker. Of Farrer’s written works, I really enjoyed his: The Freedom of the Will, and also his: The Christian Doctrine of Man. And then his early works were interesting: Theology and Analogy, etc. He has many philosophical works. Perhaps the best book I have read about his theology, is Robert Boak Slocum work: Light in a Burning-Glass, A Systematic Presentation of Austin Farrer’s Theology. But also: Captured by the Crucified, The Practical Theology of Austin Farrer, edited by David Hein and Edward Hugn Henderson was nice also. These are personal essays of others about Farrer and his theology, and pastoral life. Also note his two nice books on Scripture direct: Rebirth of Images, etc. and his other too on the Book of Revelation. Greetings ~ Today, quite by accident, I happened upon this site — the result of a Google search to gather more information on Updike’s stance (and exposure) to both Barth and Tillich. Lo and behold, I stumbled upon at least five different sites (mostly blogs) that I quickly scanned and will be returning to later to peruse much more carefully, with this being the caboose on my unexpectedly rich find. Something told me there had to be a number of people currently exchanging their takes on matters theological, touching now and then on figures influential in my own intellectual development of a generation or so ago. It was heartening to say the least to find this (although I was a little less “heartened” to find both Updike’s capsule comment, and the subsequent quip on Tillich, a trifle on the glib side — but that’s OK, and undoubtedly mainly due to my working “on the other side of the mountain,” so to speak.) Anyway, my sincere thanks for your postings here, and I will be back to take them in more very soon. I guess my own Gravitar will display when I close this (if I do this right). But if not, my home website is http://www.generuyle.com, and my two main blogs, only really getting started now, are: http://www.sensingtheway.com, and http://www.gatewaysintotheworld.com. Peace and good fortune in your delightful diggings. ;- ).